PhilBoxing.com >> News >> List of Articles >> Rich Mazon : Complete Results from the Prudential Center in Newark N.J. 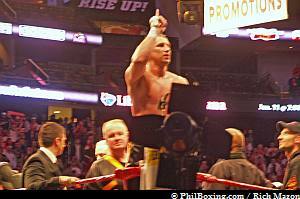 Complete Results from the Prudential Center in Newark N.J.
Newark, N.J. - Tomasz Adamek overcame the last big hurdle tonight, literally and figuratively as he prevailed against big Irish man Kevin McBride in a 12 round heavyweight bout in the Prudential Center in Newark, New Jersey. Adamek who was outweighed by 70 pounds, outpunched and outscored the slow but tough McBride resulting in a unanimous decision win for the Polish born boxer. Adamek won in all of the three judges score cards with scores of 120-107, 119-108, 119-108. The fight attracted a very large and loud Polish audience as they chanted his name from his entrance to the ring to the announcement of his win. With tonight’s victory, he is now assured of a future championship match with one of the Klitschko brothers in WBC heavyweight champion Vitali. The fight is expected to take place in his home country of Poland in September. In the co-feature fight, welterweight Sadam Ali scored a spectacular third round knock out of Javier Perez (8-4, 5 KO) of Ponce, Puerto Rico. The native of Brooklyn New York was dominant in all three rounds on a scheduled eight rounder as he unleashed a barrage of punches on Perez who went down after receiving a left hook to the head with twenty seconds left in round three. Perez spent a long time lying in the canvass after the knock down which brought his corner and the medical staff around him to assess his status. He was able to walk out of the ring though by himself after the fight. Ali improved his unbeaten record to 12-0 with seven knockouts. Andrzej Fonfara gave the predominantly Polish crowd its first victory of the night as he knocked out Ray Smith (9-5, 3 KO) of Little Rock A.K. The light heavyweight bout ended in the 1:04 mark of the fourth round drawing big cheers and ovation from his countrymen. The Warsaw born boxer improved his record to 17-2 with 8 KO’s. Jose Collado of Queens, New York added another win on his unbeaten record by beating Rafael Lora (11-3, 5 KO) of Irvington, N.J. via a split decision victory. He was deducted a point in the fourth round for a low blow resulting in a 56-57 loss in one of the judges score card. He won the other two with a score of 59-54 and 57-56. He is now 12-0 with 3 KO’s. Jose “Mangu” Peralta ( 5-1, 3 KO) of nearby Jersey City, NJ scored a third round TKO over Eber Luis Perez ( 10-16-1, 8 KO) of Colombia in the night’s second offering. Perez was unable to get up after getting knocked down the second time in the fight forcing his corner to call a halt to the bout with eleven seconds left in the round. In the opener, New Jersey welterweights in Vinnie O’ Brien ( 1-0, 1 KO) of East Hanover and Shakir Aquel Dunn (Pro debut) of Newark were involved in an exciting match that saw back and forth action between the two young fighters. O’Brien landed heavy punches on the taller Dunn in the third and last round of the fight ending in a TKO win for him in the 2:51 mark of the final round.